Antique JBT frequency meter. Reed type. 100v - 130v, 56 - 64 Hz. 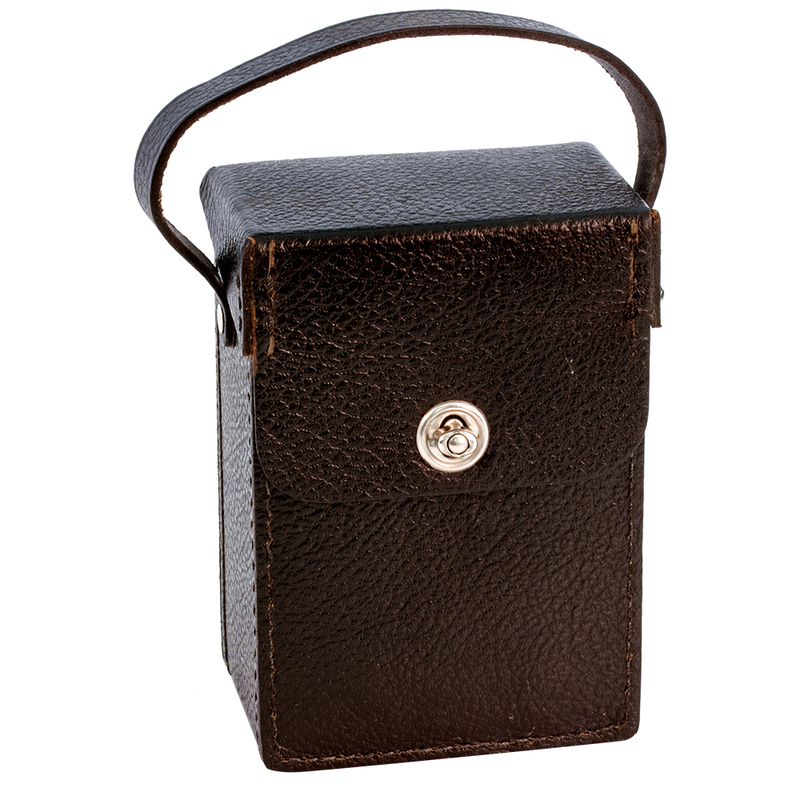 In original leather case. Excellent condition. 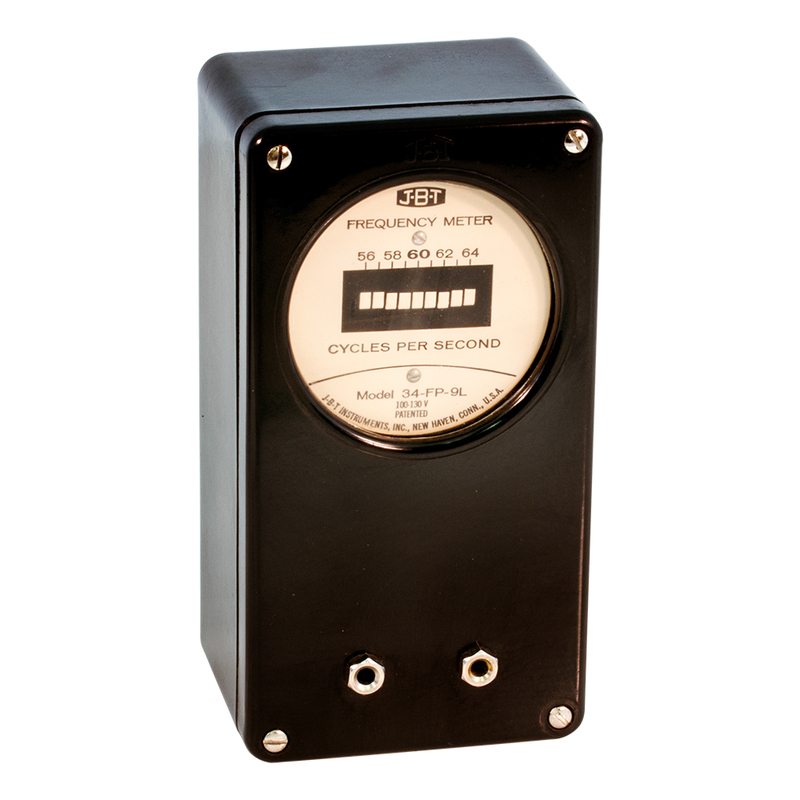 Meter is enclosed in a black bakelite case. Looks to be unused. 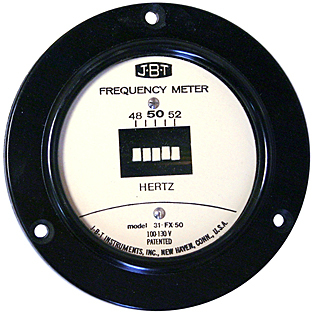 JBT reed type frequency meter indicates cycles per second both from 47 - 53 Hz and 57 - 63 Hz. 50/60 Hz. 3-1/2" diameter. Fits 2-3/4" hole. 2-7/8" deep. Perfect for monitoring the frequency of your 115v or 230v ac mains from your generator or power company. 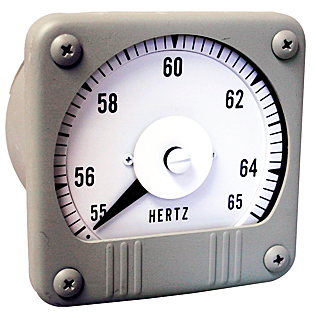 Maintaing exactly 60 Hz is important for efficiency on US mains. 50 Hz in most other countries. 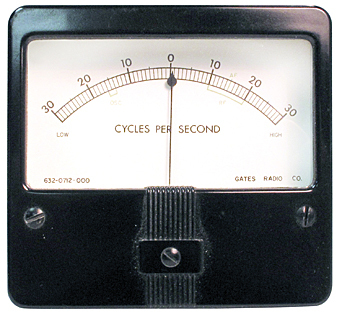 JBTfrequency meter. 39 - 41 Hz. 10 vac. 1-1/2" hole required. 2" diameter bezel. 2" behind panel depth. Scaled. 400 Hz transducer. 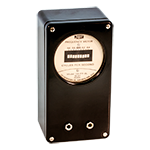 Converts @ 0 - 115 vac, 380 - 420 Hz input to a 0 - 1 madc output signal to drive a standard panel meter. 10 - 32 stud posts in / out. 2-5/8" diameter x 3" high. 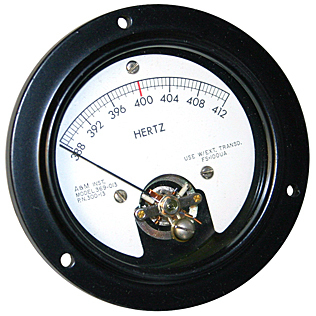 Useful for any avionic or other 400 Hz power user to monitor line voltage. 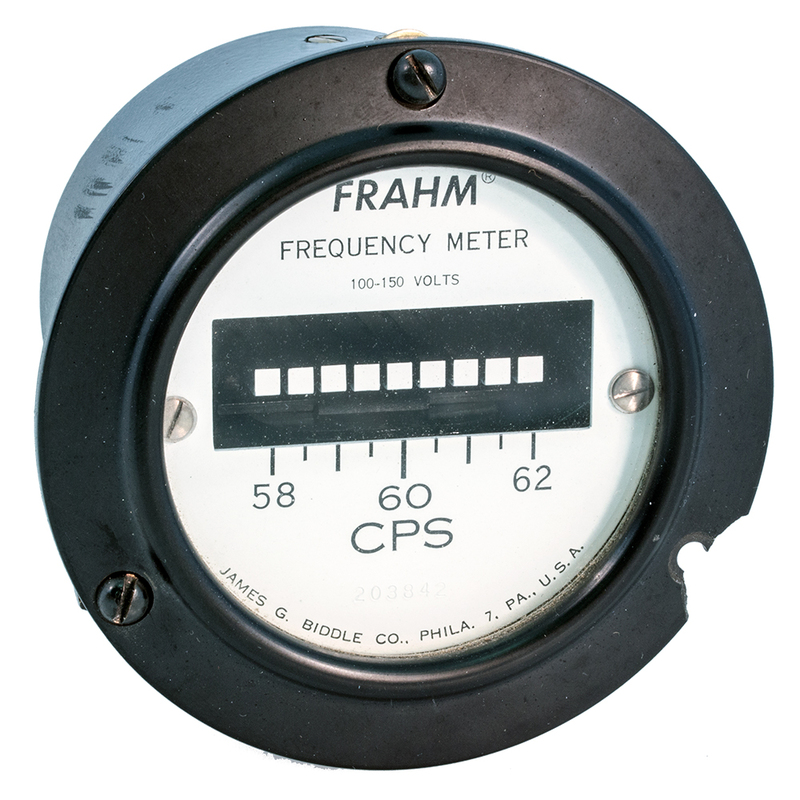 Frahm frequency meter. "Reed type". Scale reads 58 - 62 CPS. 100 - 150 volts. 3-1/2" diameter bezel. Requires 2.8" hole. 3" behind panel depth. LAST ONE! Chipped flange at screw mount. NEW. 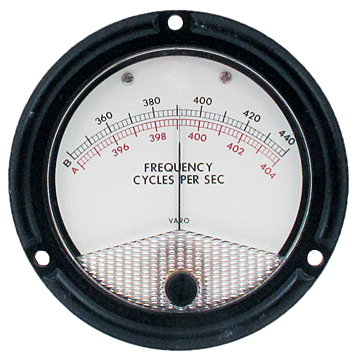 JBT reed type frequency meter indicates cycles/sec from 48-52 Hz in 1 Hz steps. 3-1/2" diameter face. 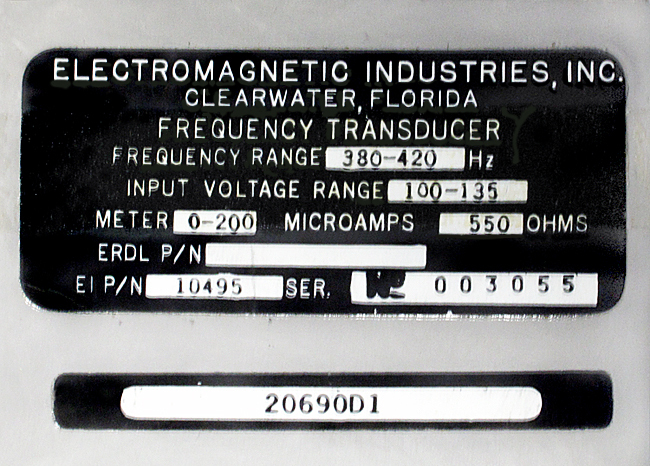 General Electric giant nuclear electronic frequency meter indicates 55 - 65 Hz. 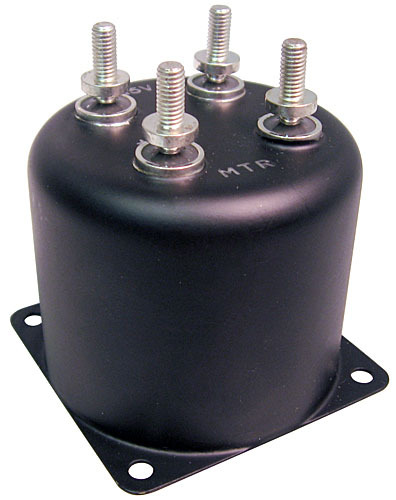 4-3/4" wide x 4-3/8" high face. 4" behind panel. Fits 4" hole. Varo AC frequency panel meter scale reads 340 - 440 Hz / 390 - 404 Hz. 4-1/2" diameter face. Fits 3-1/2" hole. 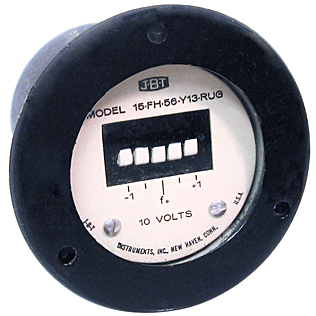 A&M sealed meter for use with external transducer. 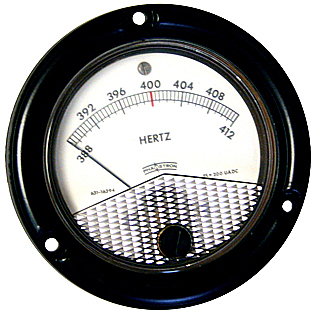 Scale: "388 - 412 Hz". Actual full scale = 100 µa. 3-1/2" diameter face. Fits 2-3/4" hole. 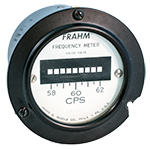 Mil-spec 380-420 Hz system includes separate transducer (631-16394) and Phaostron 3-1/2" meter (20690D1). Meter is 200 µADC full scale.